Also serving communities of Haddam. There are 5 Assisted Living Facilities in the Middletown area, with 2 in Middletown and 3 nearby. The average cost of assisted living in Middletown is $4,050 per month. This is higher than the national median of $3,346. Cheaper nearby regions include Rocky Hill with an average starting cost of $3,895. To help you with your search, browse the 35 reviews below for assisted living facilities in Middletown. On average, consumers rate assisted living in Middletown 4.5 out of 5 stars. Better rated regions include Wallingford with an average rating of 4.6 out of 5 stars. Caring.com has helped thousands of families find high-quality senior care. To speak with one of our Family Advisors about assisted living options and costs in Middletown, call (855) 863-8283. Middletown, Connecticut, located along the Connecticut River, began as a bustling seaport. This college town has New England charm and is home to the well-known Wesleyan University. In addition to quaint city life and large public parks, seniors in Middletown can choose from two Assisted Living Facilities (ALFs), and an additional 41 nearby. ALFs in Connecticut are unique as they are not licensed by the state. The Connecticut Health and Human Services department licenses Assisted Living Service Agencies (ALSAs) which then regulate residential facilities, referred to as Managed Residential Communities (MRCs). These communities must provide regular meals, social activities, maintenance and 24-hour security. The Middletown area is home to world-class medical facilities, including Middlesex Hospital, in the event of medical emergencies or illness. Violent crime in Middletown with a score of 12.2 out of 100 (1 being the safest) is very low compared to the national 31.1. Property crime is also below average at 32.4 compared to the nation’s 38.1 average. Seniors and their loved ones may enjoy the extra feeling of security in this area. Seniors are able to explore the downtown area, go shopping and get to appointments using MAT, the Middletown Area Transit. MAT buses are wheelchair accessible and offer steep discounts for senior riders. Seniors with limited mobility may have some trouble getting around in Middletown during winter. The average annual snowfall deposits about 35 inches. While summers are mild with an average July high of 84, January lows of 18 degrees might be too cold for some seniors. The American Lung Association gave the area of Middlesex County a failing grade of F for poor air quality. Seniors living with asthma or a respiratory illness could be adversely affected by this. Seniors on a budget may have a difficult time affording the Middletown area. The cost of living is rated at 113.6 compared to the national average of 100, making it 13 percent more expensive than the rest of the nation. Assisted Living costs in Middletown start around $4,050 per month on average, while the nationwide average cost of assisted living is $4,000 per month, according to the latest figures from Genworth’s Cost of Care Survey. It’s important to note that assisted living rates in Middletown and the surrounding suburbs can vary widely based on factors such as location, the level of care needed, apartment size and the types of amenities offered at each community. 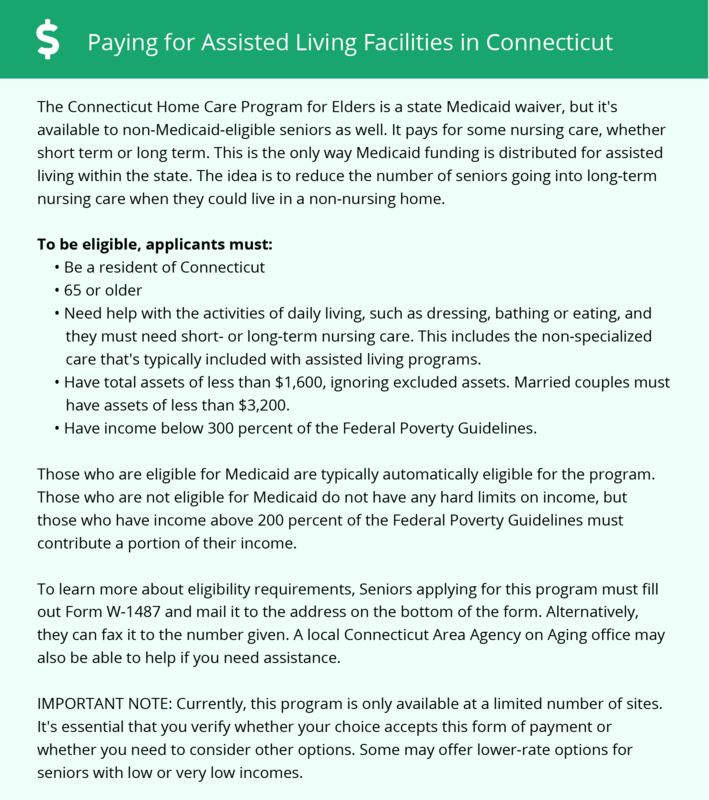 Medicaid recipients in Connecticut are able to receive help covering assisted living costs through HUSKY Health, the state’s Medicaid program. Connecticut also offers the CHCPE Alternative Care Unit, an additional program for residents in assisted living facilities. To see a list of free assisted living resources in Middletown, please visit our Assisted Living in Connecticut page. Middletown-area assisted living communities must adhere to the comprehensive set of state laws and regulations that all assisted living communities in Connecticut are required to follow. Visit our Assisted Living in Connecticut page for more information about these laws.